Welcome! Here you will find lots of Kids Christmas Crafts to welcome in the festive season. We have some lovely Preschool Christmas crafts, instructions for making your own decorative table lanterns, ideas for easy homemade christmas cards and much much more! Our Christmas crafts are fun to make and also really useful! Why not get your kids to make their own Christmas gift wrap, try some edible Christmas crafts, simple felt Christmas ornaments or and a lovely hanging dove for the tree. If you are looking for easy kids crafts this winter season these lanterns fit the bill. Quick, easy and very pretty! 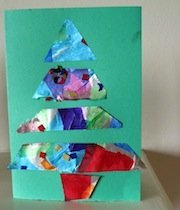 This section is full of easy Christmas crafts for preschoolers. They don't take too long, allow for lots of creativity and sensory engagement, and produce wonderful Christmas decorations for your home! This section is full edible Christmas crafts! 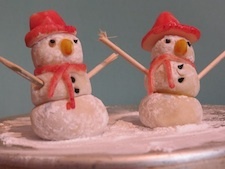 Some are very sweet and some are born out of attempt to be a bit healthier.... Make sugar mice, pretty Christmas biscuits, and marzipan snowmen. Here are some ideas for easy homemade Christmas decorations for kids, including star-shaped salt dough ornaments and clove and orange pomanders. Make Your Own Christmas Gift Wrap! 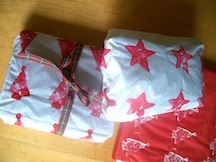 Make your own Christmas gift wrap using potato prints and tissue paper. It's is one of our really easy Christmas crafts. It's fun, useful and really beautiful. Kid's and adults will love the results! 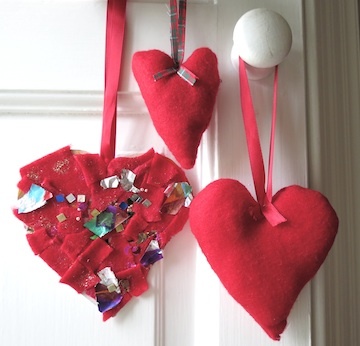 One of our favourite Christmas crafts for children - make your own homemade christmas cards! Here are a number of ideas and designs to inspire you and your kids! 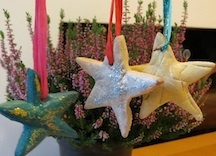 These make wonderful homemade Christmas decorations and are easy Christmas crafts for children who are slightly older. We also have a no-sew idea for younger children. We hope you enjoyed all our kids Christmas crafts. We will be adding more so do come and visit again.